Although this is the first and only time I've read this story, I highly recommend that this be the translation that you read first. Although it's been said that this translation isn't as faithful to the original poem as others, Heaney's way with words brings the story to life in standard English, and really captivated me. It's also fascinating to see the Anglo-Saxon version of the poem as well (which I am very glad that I don't have to read and interpret it in Anglo-Saxon as you have to at Oxford O_o). If you have the opportunity, give this translation a try. Now, onto the review: THIS WAS REALLY GOOD. It was a story of courage and loyalty, facing danger in order to protect fellow men. I didn't care for the tangents of previous fights and battles that mainly explained the lineage of certain characters, but knowing that lineage back when this was written was very important, I can understand why it was included. The fight scenes, although not terribly detailed, sucked me in and really imprinted themselves into my mind. Beowulf isn't a modest warrior, however, and receives tons upon tons of booty as a reward for his saving Herot from both Grendel and his mother. 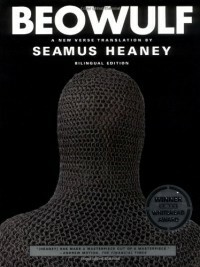 Although I prefer modest heroes, I've never really read one that isn't so it was interesting to see how it was written. It was a very captivating read and had it not been for being busy with other work, I'm sure I would have finished this in a few days instead of a week. Definitely an enjoyable epic, and one that I look forward to reading again sometime.